Diclofenac exhibits limited solubility, low bioabsorption and gastric toxicity. The objective of the study was to address the above limitations and to design a multi-particulate formulation for the chronotherapy of RA. Solid dispersions of DC with SSG and GG were prepared. 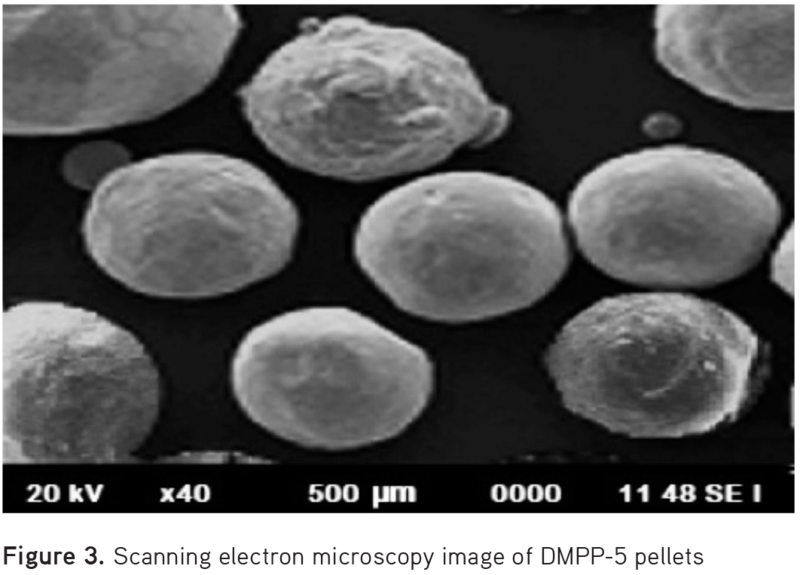 Uniform-sized (∼400 µm) non-pareil seeds were coated with solid dispersions to produce immediate-release pellets (DMP-1 and DMP-2) and controlled-release pellets (DMP-3 and DMP-4). The resultant controlled-release pellets were further layered with methacrylate polymers to obtain pulsatile-release pellets (DMPP). Solubility, FTIR, DSC, micrometrics, SEM, drug content, drug release, pharmacokinetics, and stability studies were performed for DMPP. The solubility of DC was improved by 164-folds due to the presence of hydrophilic carriers in the solid dispersions. No chemical and physical interactions were noticed in FTIR spectra and also in thermograms. A fluidized bed processor facilitated the production of high-quality, circular, and regular pellets with an angle of repose less than 19.5 degrees and DC content between 95.18% and 98.87%. The maximum drug was released from DMPP at the end of 12 hours. DMP-1 and DMP-2 pellets had 2 hr of drug release and pulsatile, controlled-release pellets had a 6 hr lag phase followed by 12 hr controlled release. Both DMP-1 and DMP-2–immediate showed first-order release followed by Hixson-Crowell kinetics, whereas DMPP pellets followed zero-order release with Higuchi’s kinetics. The maximum concentration of DC in plasma was 400.8 ng/mL at 5 hr for DMP-2 and 381.1 ng/mL at 14 hr for DMPP-5. The solubility of DC was increased with the application of solid dispersion and in turn increased the pharmacokinetics. The pellets were plausibly stable over a period of 90 days. Thus, multi-particulate pulsatile systems of DC were as effective as chronotherapeutics in the treatment of circadian rhythm-based ailments such as RA. DC, a regular medication used in the management of RA, was chosen as the model drug in this study.12 The aim was to develop multi-particulate systems of DC- containing immediate- and pulsatile-controlled release pellets using non-pareil sugar seeds to avoid gastric mucosal damage and enable pulsatile release in the small intestine. DC and non-pareil seeds were donated by M/s. Lee Pharma, Visakhapatnam, India. Guar gum (GG), sodium starch glycolate (SSG), eudragit RS100 and eudragit L100 were purchased from S.D. Fine Chem., Mumbai, India. All other chemicals and reagents used in the study were of analytical grade. A known quantity (a batch) of non-pareil seeds were coated with DC:SSG and DC: GG solid dispersions in 1:1 and 1:2 proportions. This results in the production of immediate- and controlled-release pellets. The chemical compatibility of DC and polymer mixtures was examined using an ATR-FTIR spectrometer (Agilent CARY 630 ATR-FTIR). 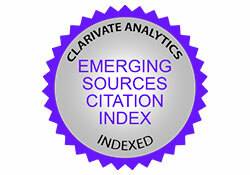 The sample to be tested was placed on a diamond ATR crystal and analyzed by means of Agilent resolutions pro software. Each spectrum was checked with 32 single average scans at 4 cm-1 resolution in the 400-4000 cm-1 absorption region. Thermal analysis of DC and polymer mixtures was performed using a DSC (Shimadzu DSC-50) to check the physical compatibility. During each scan, about 1 to 2 mg of the sample was positioned in sealed aluminum sample pans at a rate of 10°C/min under a nitrogen atmosphere between 25°C and 350°C. An empty aluminum pan was used as reference. The surface morphology and cross-section of the prepared pellets was determined using a SEM (Jeol, JSM-1600, Tokyo, Japan). The pellets were coated with fine gold in a 10 mA ion current for 5 min under 0.1 Torr pressure using an ion sputter and laden on studs for examination. A batch of pellets was transferred into a calibrated volumetric flask and dissolved in 10 mL of methanol by ultra-sonication for 10 sec. The volume of the preparation was made up to 100 mL with the same, filtered, and assayed. 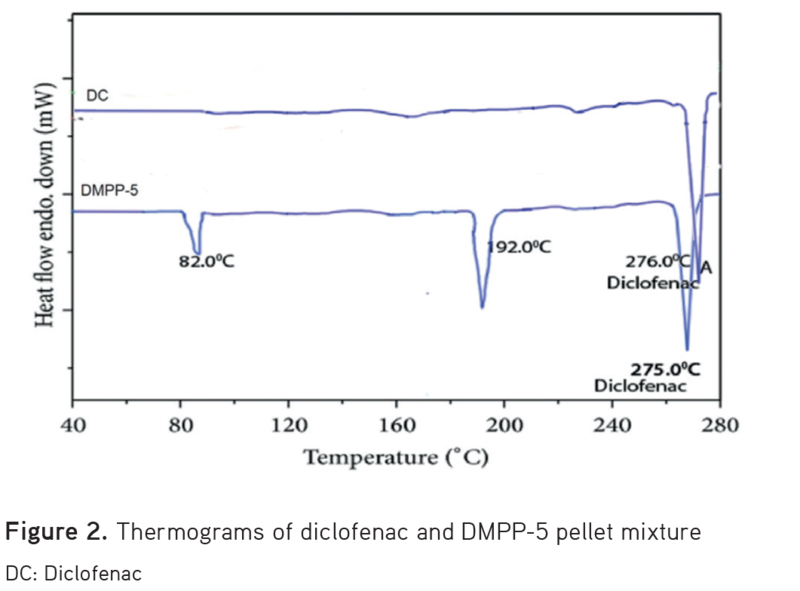 Pellets of DMP-1 to DMP-4 and DMPP-1 to DMPP-5 equivalent to 100 mg of drug were subjected to in vitro drug release studies using USP type I dissolution test apparatus at 37°C and 50 rpm in 0.1 N HCl, pH 6.8 and pH 7.4 as dissolution media for the first 2 hr, the next 3 hr, followed by the next 13 hr, respectively. Five-milliliter aliquots were withdrawn at various time intervals by maintaining sink conditions, filtered, and analyzed. The study was repeated for six independent observations and the results were built into diverse kinetic models. Groups 1, 2, and 3 were administered DC, DMP2, and DMPP-5 samples, respectively. Blood samples of about 1 mL were collected into heparinized Eppendorf tubes at regular time intervals. The samples were shaken thoroughly, centrifuged at 1500 rpm, and plasma was collected. A previously developed and validated high-performance liquid chromatography (HPLC) method was employed20 to determine the plasma drug concentrations as a function of time. The C18 (250 mm × 4.6 mm, 5 µm) column, a mixture of acetonitrile and methanol (70:30, v/v) as the mobile phase, and UV detector (276 nm) were adopted and Empower software version-2 was used to assay the DC concentrations in plasma against DC as an internal standard. Samples of about 20 µL were injected into the HPLC system (Waters, 2695) after filtering the plasma through a 0.2 µm membrane filter. The mean concentrations of DC in plasma samples as a function of time were calculated. 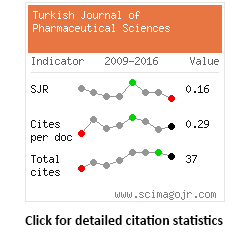 The pharmacokinetic parameters such as t1/2, Ke and Vd were characterized and compared statistically using analysis of variance (ANOVA) and the Tukey-Krammer test was applied for the columns comparison. P <0.05 was considered a statistically significant correlation. Pulsatile drug delivery as multi-particulate systems have been demonstrated to be successful technologies to overcome limitations such as low solubility and less bioabsorption faced by BCS class II and IV drugs as single-unit drug delivery systems. This solubility study resulted with increased solubility of DC by 164-fold because solid dispersion was employed along with hydrophilic polymers. The resultant amorphous solid dispersions of DC displayed good micrometrics. The FTIR spectra (Figure 1) of DC confirmed the existence of peaks at 3317, 1677, 1120, and 745 cm-1 due to NH stretching, C=O stretching, C-O bending, and C-Cl bending as characteristic functional groups of DC. Similar functional groups indicating peaks were observed without significant shifting of DC in the DMPP-5 mixture. As shown in Figure 2, DSC thermograms displayed endothermic peaks of DC at 276°C and DMPP-5 at 275°C, respectively. The SEM image (Figure 3) of pellets demonstrated smooth, well separated, spherical, and uniformly-distributed, micron-sized particles with 400-500 µm range. 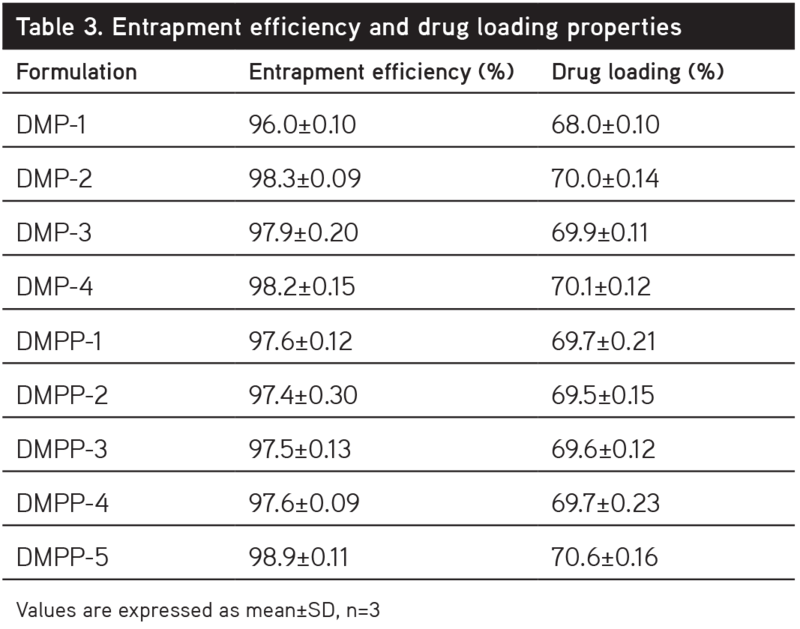 The pellets (both types), prepared using the Wurster process, displayed substantial entrapment efficiencies and drug-loading capabilities as mentioned in Table 3. 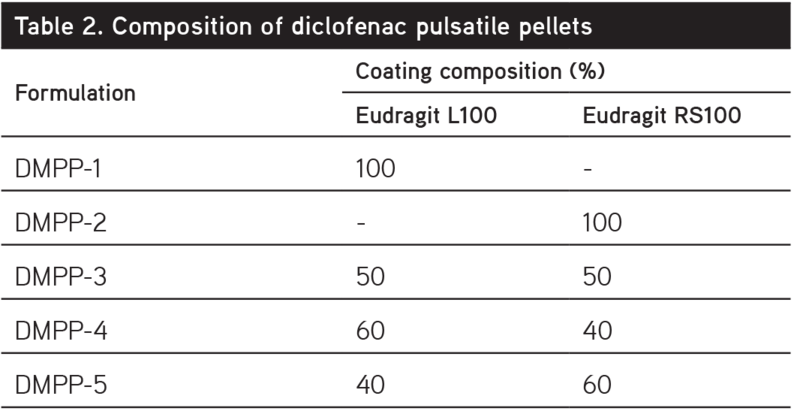 In vitro drug release profiles of the DC pellets are depicted in Figure 4 and 5. SSG, a hydrophilic carrier composed DMP-1 and DMP-2 pellets, demonstrated burst drug release as 94.2% and 99.5% at the end of the second hour. The controlled-release pellets, DMP-3 and BMP-4, had 98.9% and 99.1% at end of the tenth hour due to the composition of hydrocolloidal polymer GG. 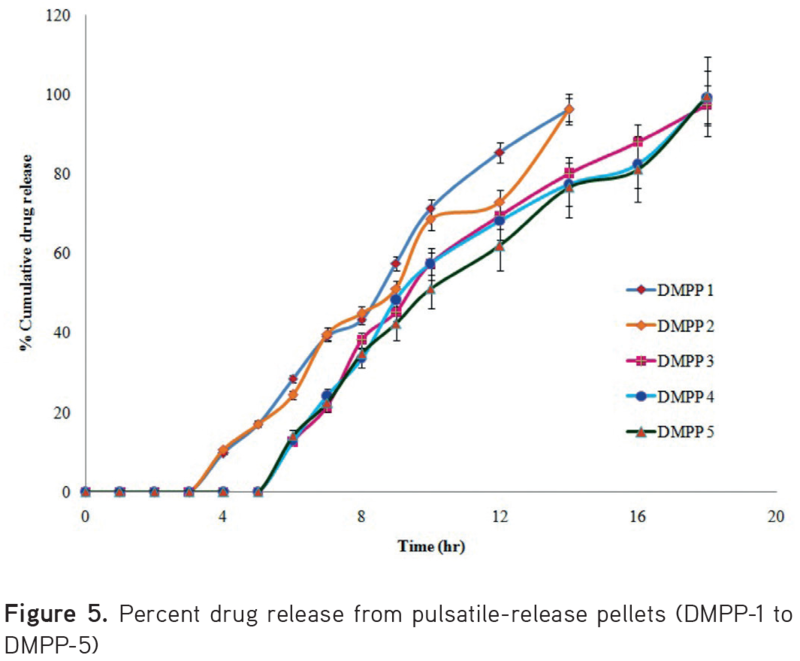 The pulsatile-release pellets, DMPP-1-DMPP-5, showed 96.1%, 96.3%, 97.4%, 99.1%, and 99.5%, respectively, at the end of the 18th hour (with a 6-hr lag phase). The release of DC from immediate-release pellets followed first-order release with Hixson-Crowell cube root model kinetics, whereas pulsatile-release pellets followed zero-order with the Higuchi kinetic model. The developed HPLC method eluted the DC peak with a retention time of 2.34 min as shown in Figure 6. The limit of detection and limit of quantification for the HPLC method was found to be 3 and 9 ng/mL, respectively. Upon assaying the plasma samples using this validated HPLC method, the plasma kinetics as function of time were demonstrated in Figure 7. The pharmacokinetics of the DMP-2 pellets such as t1/2, Ke and Vd were found to be increased by 2.03, 1.733, and 1.55-fold, respectively. Bioavailability parameters viz., Cmax, tmax and AUC were increased by 1.9, 1.72, and 1.25 times, respectively, when compared with DC. 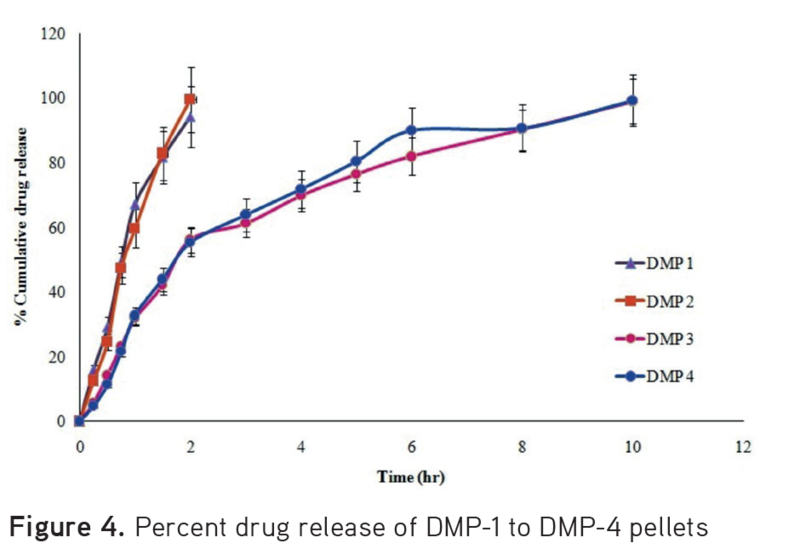 In the case of pulsatile pellets, the DMPP-5 formulation had 5.78, 4.1, and 1.82-fold increase in pharmacokinetics and about a 1.82, 4.82, and 1.31-times increase in bioavailability parameters, respectively, as given in Table 4. The physicochemical properties for all pellets were intact over a period of 90 days due to the eudragit coatings. There were no changes in the evaluation parameters of the pellets even after exposure to various temperature and RH conditions. The kneading technique employed in the formulation facilitated the entanglement of particles to the molecular level as polymeric networks and therefore enhanced solubility of DC was achieved with solid dispersions. Moreover, the solid dispersions of DC showed amorphous geometry with excellent micrometric properties. SSG and GG have become well established as carriers in the recent past and were shown to be compatible with DC moiety as evidenced in the FTIR spectra. There were no chemical bonds established between DC and carriers other than hydrogen bonding, which was evidenced in the wave numbers of the FTIR spectrum. Thus, the spectra showed no chemical interactions between DC and the carriers selected in the study. 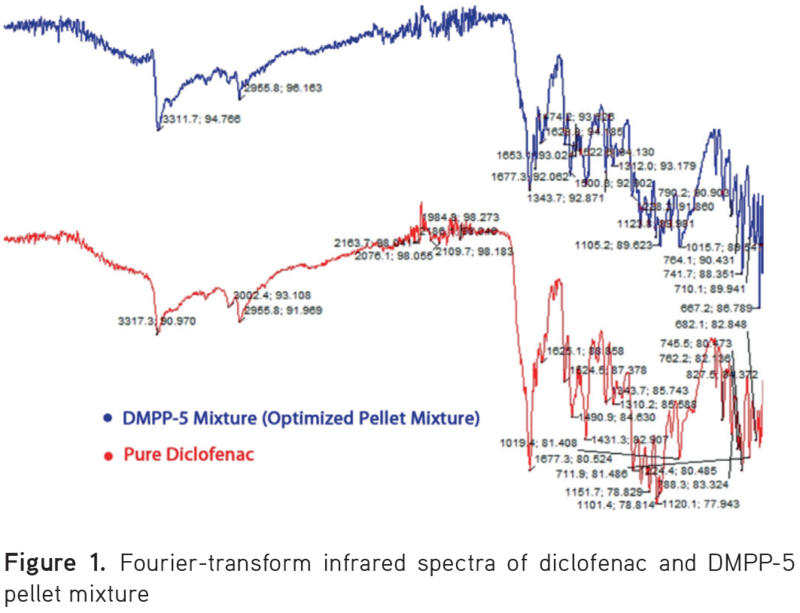 The same was attributed in thermograms of DMPP pellets because a minor shift in the endothermic peak of DC was identified in DMPP-5’s thermogram as a characteristic interaction between drug and the selected carriers. The defined surface morphology of the pellets was possible only due to the accurate layering of DC on sugar spheres. The dimensions of pellets were linearly increased with the composition of eudragit as coating solutions and the same result was seen in SEM images. Pulsatile pellets were relatively larger than immediate-release pellets because they had undergone two steps of coating and also had a methacrylate polymer coating. The Wurster process using fluidization was successful in producing the non-agglomerated, free-flowing and moderately high DC content (95.18-98.87%) pellets. The pellets with good entrapment efficiency and drug loading were selected for coating with eudragits so as to produce pulsatalie drug release pellets. Eudragit RS100, a polymer of enteric grade and a cationic polymer with low permeability, provides additional sustaining activity of drug release along with the gelling properties of GG. Eudragit L100, which is an anionic polymer with high permeability, helps in maintaining the lag phase for about 6 hr. DMPP pellets were composed of a swellable polymer, GG, and enteric polymers (Eudragit L100 and Eudragit RS100). Optimized pulsatile release of DC was achieved with desired lag phase from DMPP pellets owing to typical composition of hydrocolloidal GG and pH dependent eudragits. Enhanced oral absorption of DC was resulted with multi-particulates. 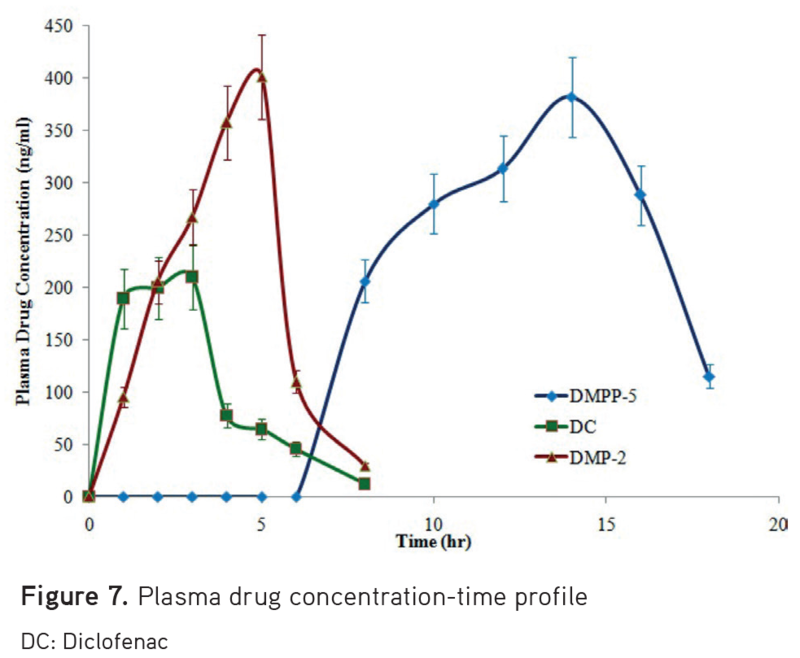 Quick onset of action from DMP-2 formulation was displayed due to presence of SSG, a hydrophilic carrier and same was evidenced in the HPLC data of plasma DC concentrations. Micron-size pellets of immediate-release contributed to the loading dose, and the pulsatile pellets contributed to the maintenance dose of drug in rabbits. The contribution of GG, a polycolloidal polymer, resulted with controlled release of DC from DMPP to reach a maximum concentration in plasma. The desired lag phase of 6 hr was achieved with a typical composition of anionic and cationic methacrylate polymers (Eudragits) at 40:60 ratios. Increased bioabsorption and pharmacokinetics of DC by multi-particulate pulsatile formulation were evident and hence it was attributed to reach adequate concentrations of DC at the synovium to reduce the inflammation. Administration of DMP-2 and DMPP-5 pellets as multi-particulate formulations of DC could produce both immediate- and controlled-release profiles of DC at a predetermined time in the small intestine so as to cater for the requirements of chronotherapy of RA. The physical stability of the pellets was due to the application of superior technology (fluidized coating) and methods (solution layering) in the study. Solid dispersions were prepared using different hydrophilic polysaccharides and methacrylate polymers to address the solubility issues of DC. A novel solution layering technique was employed in association with a fluidized bed processor to obtain typically micron-sized, smooth-surfaced and spheronized pellets of the immediate-release and controlled--release category. Further, controlled-release pellets were coated with enteric polymers to produce a 6-hr lag phase in drug release. Promised in vitro drug release profiles were achieved by pulsatile technology-based multi-particulates of DC to cater for the needs of chronotherapy of circadian rhythm-based chronic diseases such as RA. Thus, the suitability of applied technologies in the design of multi-particulate drug delivery systems in chronotherapy of RA using DC was convincingly proved using in vitro evaluations. The outcomes of the in vitro study were further fortified by in vivo studies using rabbits. While characterizing the plasma drug concentrations using sensitive and precise HPLC methodology, plasma-drug parameters such as t½, and Ke were proved as suitable chronopharmacokinetic parameters. The characteristics and parameters of bioavailability also contributed to this chronomodulated delivery of DC. It was concluded that, the design of spheronized pulsatile pellets of DC is useful in the chronotherapy of RA, but scale-up techniques are required for commercial viability. The authors are thankful to M/s. Lee Pharma, Visakhapatnam for gratis of DC. Financial Disclosure: The research received no specific grant from any funding agency in public, commercial or not-for-profit sectors. Cheng HY, Penninger JM. DREAMing about arthritic pain. Ann Rheum Dis. 2004;63(Suppl 2):72-75. Huskisson EC, Hart FD. Pain threshold and arthritis. Br Med J. 1972;4:193-195. Konttinen YT, Honkanen VE, Grönblad M, Keinonen M, Santavirta N, Santavirta S. The relation of extraarticular tenderness to inflammatory joint disease and personality in patients with rheumatoid arthritis. J Rheumatol. 1992;19:851-855. Castillo BA, El Sallab RA, Scott JT. Physical activity, cystic erosions, and osteoporosis in rheumatoid arthritis. Ann Rheum Dis. 1965;24:522-527. Van Laar M, Pergolizzi JV Jr, Mellinghoff HU, Merchante IM, Nalamachu S, O’Brien J, Perrot S, Raffa RB. Pain treatment in arthritis-related pain: beyond NSAIDs. Open Rheumatol J. 2012;6:320-330. Perrot S. Should we switch from analgesics to the concept of “pain-modifying analgesic drugs (PMADS)” in osteoarthritis and rheumatic chronic pain conditions. Pain. 2009;146:229-230. Peesa JP, Yalavarthi PR, Rasheed A, Mandava VBR. A perspective review on role of novel NSAID prodrugs in the management of acute inflammation. J Acu Dis. 2016;5:364-381. Sweetman SC. Martindale: The complete drug reference, Royal Pharmaceutical Society, (36th ed). London; 2009:44. Nandakishore R, Yalavarthi PR, Kiran YR, Rajapranathi M. Selective cyclooxygenase inhibitors: current status. Curr Drug Discov Technol. 2014;11:127-132. Sharma PR, Lewis SA. Design and in vitro/in vivo evaluation of extended release matrix tablets of nateglinide. J Young Pharm. 2013;5:167-172. Vadlamudi HC, Raju YP, Asuntha G, Nair R, Murthy KV, Vulava J. Assessment of hupu gum for its carrier property in the design and evaluation of solid mixtures of poorly water soluble drug - rofecoxib. Curr Drug Deliv. 2014;11:62-71. Kroenke K, Krebs EE, Blair MJ. Pharmacotherapy of chronic pain: a synthesis of recommendations from systematic reviews. Gen Hos Psych. 2009;31:206-219. Prasannaraju Y, Chowdary VH, Jayasri V, Asuntha G, Kumar NK, Murthy KV, Nair R. Bioavailability and pharmacokinetic studies of rofecoxib solid dispersion. Curr Drug Deliv. 2013;10:701-705. Ahuja N, Katare OP, Singh B. Studies on dissolution enhancement and mathematical modeling of drug release of poorly water-soluble carriers. Eur J Pharm Biopharm. 2007;65:26-38. Politis SN, Rekkas DM. Pelletization processes for pharmaceutical applications: a patent review. Recent Pat Drug Deliv Formul. 2011;5:61-78. Gowda DV, Aravindram AS, Venkatesh MP, Khan MS. Development and evaluation of clozapin pellets for controlled release. Int J Res Ayur Pharm. 2012;3:611-618. Raval MK, Ramani RV, Sheth NR. Formulation and evaluation of sustained release enteric-coated pellets of budesonide for intestinal delivery. Int J Pharm Investig. 2013;3:203-211. Bhattacharya SS, Banerjee S, Ghosh AK, Chattopadhyay P, Verma A, Ghosh A. 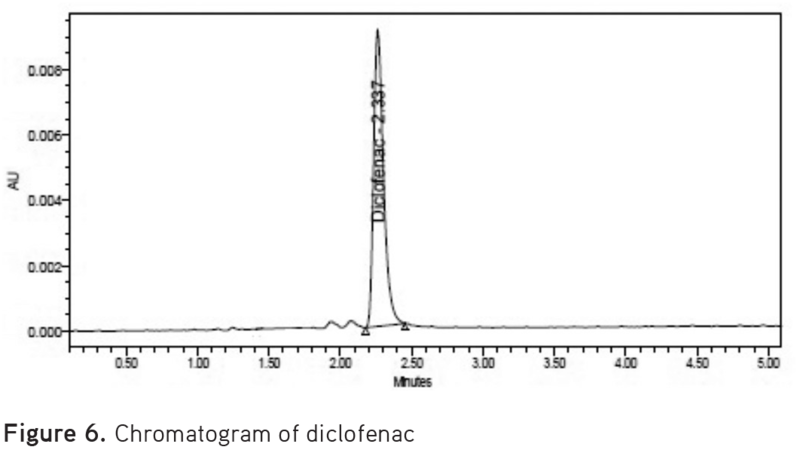 A RP-HPLC method for quantification of diclofenac sodium released from biological macromolecules. Int J Biol Macromol. 2013;58:354-359. Nagpal M, Maheshwari D, Rakha P, Dureja H, Goyal S, Dhingra G. Formulation, development and evaluation of alginate microspheres of Ibuprofen. J Young Pharm. 2012;4:13-16. Lu Y, Sturek M, Park K. Microparticles produced by the hydrogel template method for sustained drug delivery. Int J Pharm. 2014;461:258-269. Nanda Kishore R, Yalavarthi PR, Vadlamudi HC, Vandana KR, Rasheed A, Sushma M. Solid self microemulsification of Atorvastatin using hydrophilic carriers: a design. Drug Dev Ind Pharm. 2015;41:1213-1222. Vadlamudi HC, Yalavarthi PR, Mandava Venkata BRM, Thanniru J, Vandana KR, Sundaresan CR. Potential of microemulsified entacapone drug delivery systems in the management of acute Parkinson’s disease. J Acu Dis. 2016;5:315-325.